West Side Filmworks is a documentary filmmaking workshop for students age 16 through 19. 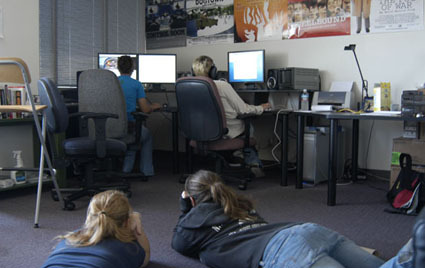 Classes cover all aspects of production, from topic research and equipment operation, to output and festival submission. Our small workshops follow a real-world workflow. This is not camp. Our workshop looks and operates as a post-production studio. We don't teach you that everyone will become a film star. You will specialize. You will learn your limitations, in skill, but also in time and money. Every project we complete has a venue. Whether it's film school entrance committees or the festival circuit, students gain experience targeting specific goals and audiences. Work alongside Academy Award winning producers and directors, video producers for the New York Times, and many other industry professionals to create focused content for use in reels and college applications. All courses use cutting-edge equipment, refreshed each year to keep you current with emerging trends in an ever-evolving industry.